The last former Southern Pacific wigwag, located in Anaheim, Ca. was removed on February 25, 2019. Union Pacific crews came in that morning and removed the 98 year old signal. No word yet on where it will end up. I once heard that OERM was interested, but no confirmation on that. 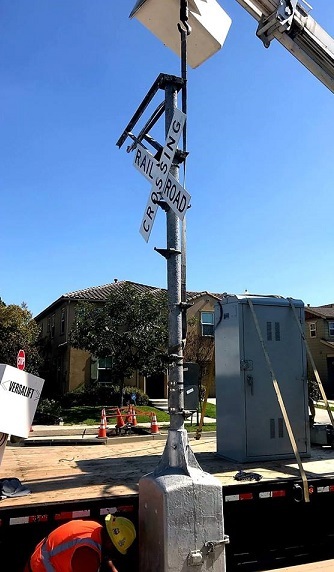 More photos of this signal, including removal, here. This leaves one active wigwag left in Southern California, at Vernon. This site is totally dedicated to the vanishing "Wigwag Flagman" signal. There aren't many left. Here you can find out where they are still in service, both on revenue generating rails, as well as museums. Pretty much all that remain were built by the Magnetic Signal Company of Los Angeles. Some were built by Western Railroad Supply Company (Magnetic Autoflag) as well as the cumbersome Union Switch and Signal wigwag. Currently there are over 75 pages full of photos, location information, technical, and restoration content on this site. You may want to bookmark this page because you probably won't get through it all in one sitting. New stuff is added as often as possible. The purpose of this site is very similar to that of Semaphores.com, to track down what remains of these antiques that are still in service. I may expand to other forms of early crossing signals, depending on what kind of information I get in. I am always looking for new information on wigwags and their locations. If you know of one still in service in your area, or even on display somewhere, please let me know . I'm also looking for any technical information that I can share on this site.